A stunning new production ‘Aerial Ireland’ by Tile Films will air on be3 on Monday 9th January at 9pm. Originally directed and produced for the Smithsonian Channel USA by award winning filmmaker Stephen Rooke of Tile Films (Waterways, Saving the Titanic), the premiere of ‘Aerial Ireland’ will air as a landmark programme to celebrate the launch of TV3 Group’s newest channel. This documentary film is a story and a landscape of Ireland seen from an entirely new and uniquely revealing perspective—revealing its geology, natural terrain, human history and built environment as seen from the air. 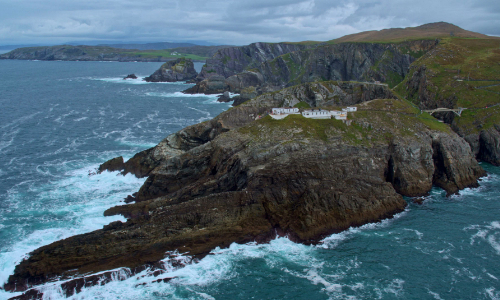 Using drone aerial photography, this documentary narrated by radio presenter Venetia Quick presents viewers with a spectacular overview of the beautiful and historically significant island of Ireland and its coast. It shows all from the primeval landscapes forged by the retreating glaciers of the Ice Age to the Neolithic tombs and prehistoric forts of the Celtic era. You can get a glimpse of architecture from the early Celtic church, the medieval towns and castles of the Viking and Anglo-Norman eras and the bustle and hum of modern cities in the information age. On the east coast, the programme explores the ancient history of Ireland with spectacular aerial footage of the Neolithic tombs and necropolis of Newgrange, Knowth and Dowth–monuments to the technology and spirituality of Ireland’s early civilization that predates the Egyptian pyramids. Flying over Dublin, cameras capture the sprawling capital city, from its suburbs, to the historic Georgian squares and pre-independence architecture of the city centre and on to the majestic 21st century centrepiece of the Digital Docklands – European HQ of Google, Facebook, and a host of indigenous Irish tech start-ups. 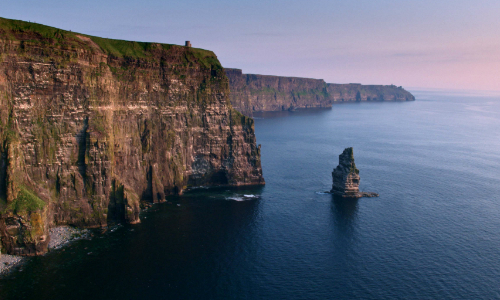 The programme samples the beauty of the West of Ireland, historic bastion of Irish culture during the dark colonial era: from county Galway’s wild Atlantic coasts and the vertiginous Cliffs of Moher to the ethereal limestone landscape of the Burren, the Neolithic Ceide Fields of county Mayo and the dry stone walls that typify the wilds of Connemara. On the southern coast, there’s the extraordinary breath-taking beauty of Kerry, the vast national park of Killarney and the extraordinary promontory of the Skelligs - the great vertical crags where Christian monks built a desolate hermitage, more recently used as a location for the new Star Wars movie. Aerial Ireland will also survey the great medieval fortresses of Trim Castle, and the ancient castles of Ashford, Blarney, and Dunluce. Viewers will see the imposing architecture and vast horticultural demesnes of great country houses such as Belvedere, Castlehyde and Luggala Estate, as never seen before. In the northeast, the film follows the North Atlantic coastline to the famous Giant’s Causeway of county Antrim – a UNESCO site and one of the natural wonders of the world. 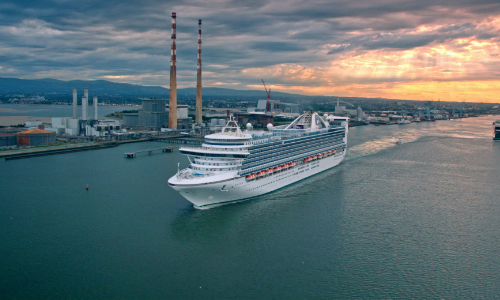 Attention then moves to Belfast - Ireland’s second largest city – taking in the Victorian splendour of its cityscape and the industrial heart of its docklands, home to the shipyard where the Titanic was built. Aerial Ireland presents the island of Ireland as never seen before – an unparalleled flight from geological and natural prehistory through 12,000 years of human habitation on this unique gem of Western Europe. 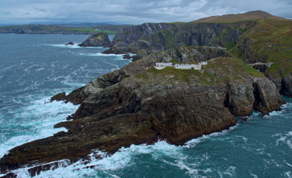 ‘Aerial Ireland’ airs on Monday 9th January at 9pm on be3. be3 will be available on channel 106 on Virgin Media, channel 116 on Sky, channel 106 on Saorview, channel 108 on Eir’s eVision and channel 106 on Vodafone.